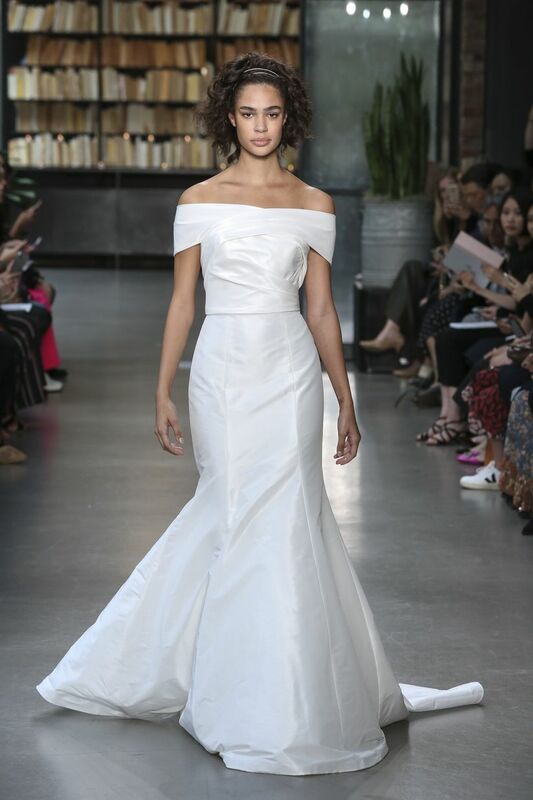 Old Hollywood wedding dresses were a major trend at New York Bridal Fashion Week, with designers going "old school" and using off-the-shoulder necklines, luxurious fabrics, ball gown silhouettes, and other statement-making details to elicit vintage glam vibes in their fall 2019 collections. Designers were inspired by the grandeur of Hollywood's Golden Age, an era between the 1930s and the late 1950s that saw stars such as Marilyn Monroe, Audrey Hepburn, and Elizabeth Taylor rise to fame. Decades later, these OG style icons are still influencing women's fashion, from street style and beauty routines to Old Hollywood glamour wedding dresses. Grab your red lipstick and get ready to feel like a million bucks as you walk down the aisle! See why we're loving these Old Hollywood wedding dresses. 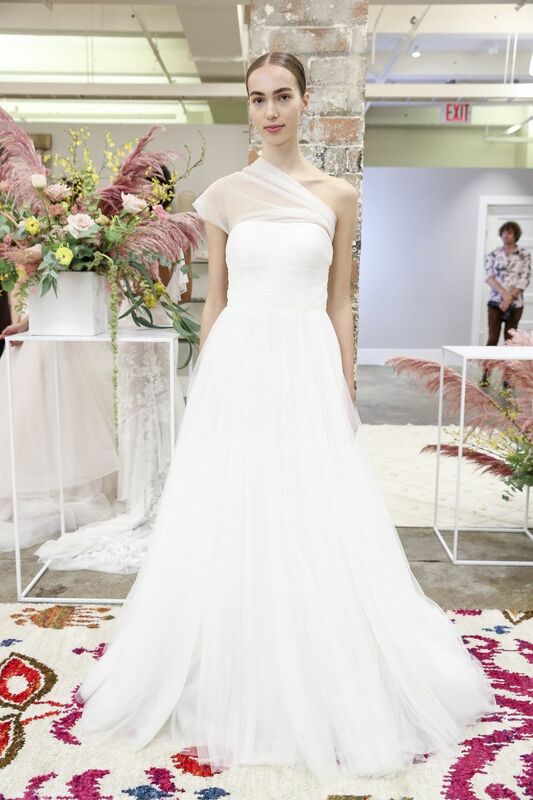 Turn the aisle into your very own red carpet moment by donning a figure-hugging silhouette like this trumpet gown by Anne Barge. The peplum train and silk mikado scuba add even more luxe to this already glam style. Not only is this crisp white dress perfect for minimalist brides, but it also has major retro glam vibes. 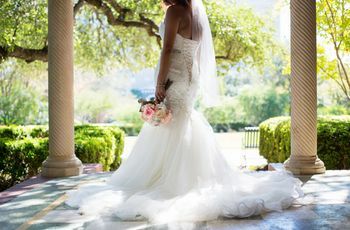 The strapless neckline, mermaid silhouette, and long pooling train are all quintessential components of an Old Hollywood wedding dress. A thigh-high slit brings the wow factor to this Parisienne silk dress by Australian designer Moira Hughes. The long billowing skirt is ultra-comfortable and ideal for dancing the night away! If you're going for a classic, timeless aesthetic, the latest collection by Sareh Nouri will totally wow you. 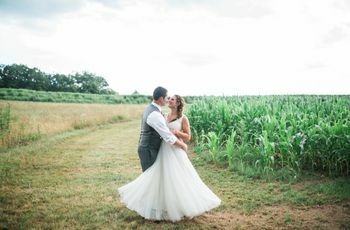 It was filled with celeb-worthy designs, including this gorgeous shantung gown featuring a draped bodice, trumpet silhouette, and scoop neckline. A structured column silhouette and an empire waist are retro in the chicest way. This Isabelle Armstrong dress would suit a modern-day Jackie Kennedy — gloves and bouffant updo optional! Show off that décolletage with an elegant off-the-shoulder style. A trumpet silhouette dress that's fitted through your waist and hips will create a stunning hourglass figure à la Marilyn Monroe. A beaded ball gown only needs one accessory: a luxurious fur wrap. This gorgeous Justin Alexander dress would be a great choice for a formal winter wedding. In addition to voluminous ball gowns, slinky satin dresses were an evening wear staple during Hollywood's Golden Age. 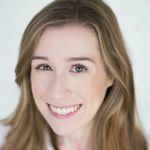 This Old Hollywood wedding dress style is just as relevant today, as proven by Meghan Markle's reception look.. If your idea of old school glam is more 1970s bedazzling and less 1950s pearls, you'll love this one-shoulder dress by Limor Rosen. We could totally picture Cher rocking a fabulous beaded style like this back in the day! An off-the-shoulder neckline + buttons all the way down the back = utter elegance. These are classic details for a reason! For an Old Hollywood wedding dress that's less va-va-voom and more romantic, we love this BHLDN style. The tulle skirt and one-shoulder neckline could have been seen on dresses 60 years ago, and they're still on-trend today. This is a Grace Kelly moment if there ever was one. 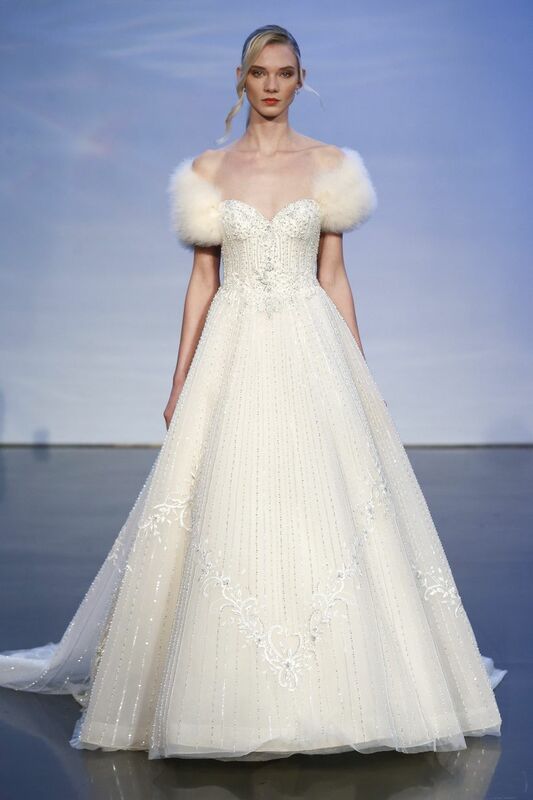 While this Ines Di Santo gown feels more "royal wedding" than "red carpet," we couldn't resist including it in our faves. Grace Kelly was Hollywood royalty before becoming actual royalty upon marrying Prince Rainier III in 1956. This dress captures the essence of Kelly's iconic gown, but with a 21st Century spin — the v-neckline and allover lace are two modern updates.